Happy Friday! 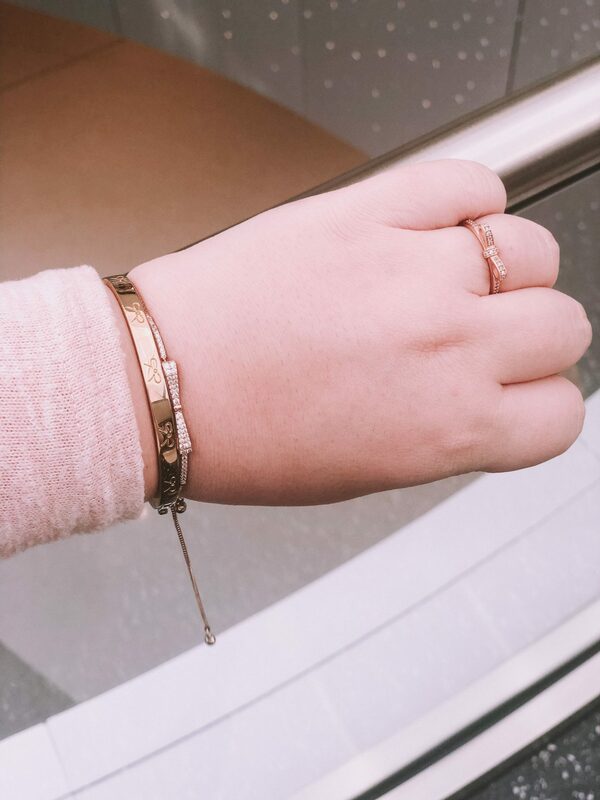 Today I’m finally sharing my go to everyday dainty jewelry pieces! I’ve been meaning to get this post up for a week now but I had to add the final touches. Now that it’s here I can’t wait to show the pieces I’ve been wearing as I always talk about them in my outfits but never show you up close details and where I bought them. I am so happy with the collection I’ve built up and everything matches my aesthetic and me as a human. 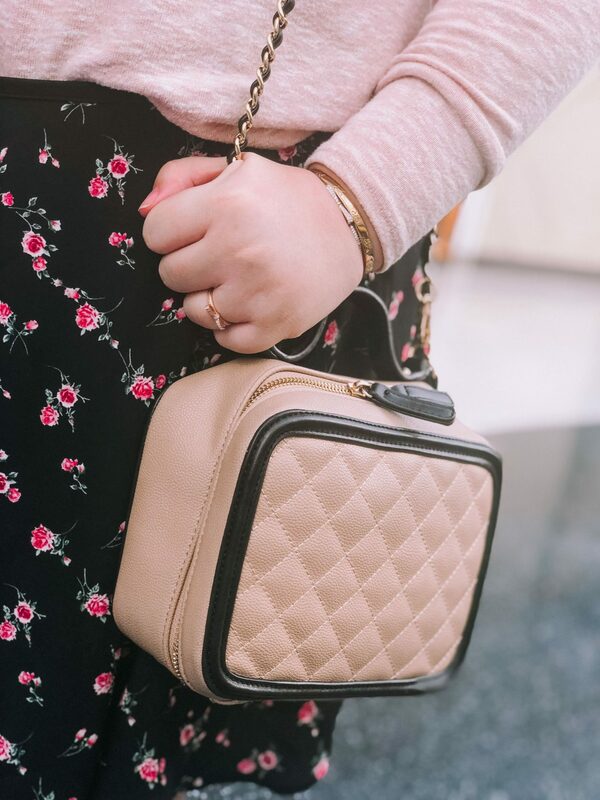 So here are my go to everyday dainty jewelry pieces, a tour of my jewelry and how I store them! Before we jump in, let me share my outfit! 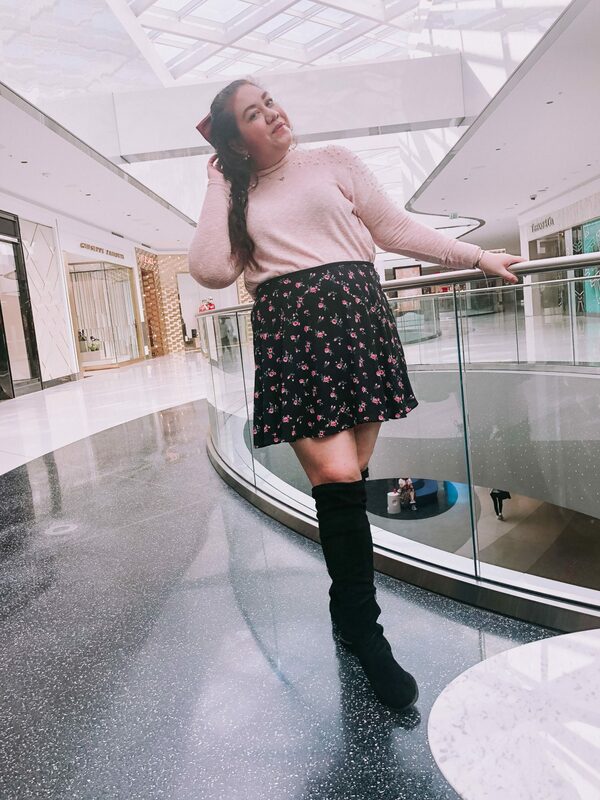 When I shoot these a few weeks ago it was still pretty chilly in LA but I could get away with a sweater and over the knee boots with my skirt. I love this outfit and it was perfect for the transitioning weather at the moment. I love the print of this skirt and it’s just so cute. Also my sweater has little pearls on it so I knew it was perfect to go with talking about my jewelry. 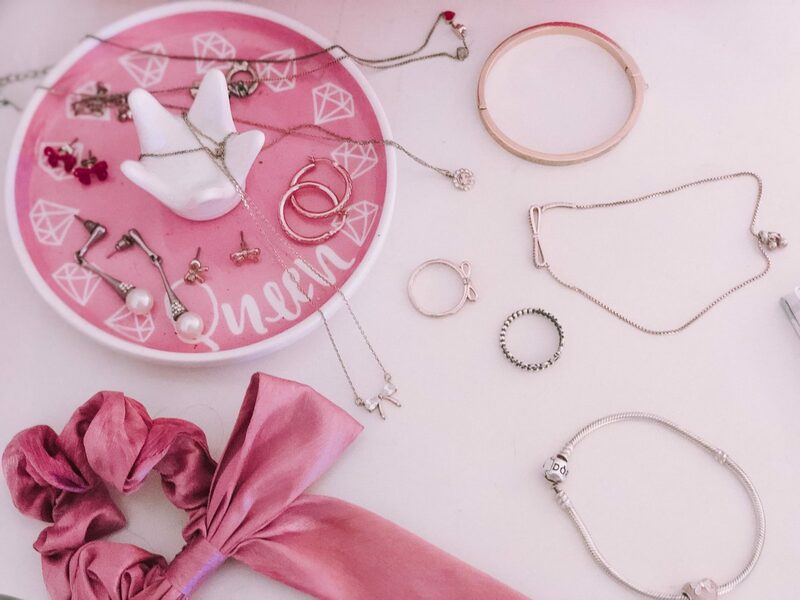 Now to start with my go to everyday dainty jewelry pieces, I thought I would show you where I keep them. You first saw a sneak peak in my bedside table essentials I wrote here. I usually keep them in this crown dish I bought from Marshall’s. It’s the cutest and I just put my everyday pieces on there at the end of the day. I’s so handy and it matches my decor and aesthetic so I love placing my bracelets and such on it. I also keep some of my rings in their boxes. The rest of my jewelry collection is in it’s travel bag and I dig out the pieces I want to wear when I need them so the rest are safely put away in a jewelry case. I guess I can start with my go to rings lately. I’ve never been a ring person until a few months ago. I never could find ones that could fit or that I liked. I did always have to rings on my wish list and last December I manged to buy both. 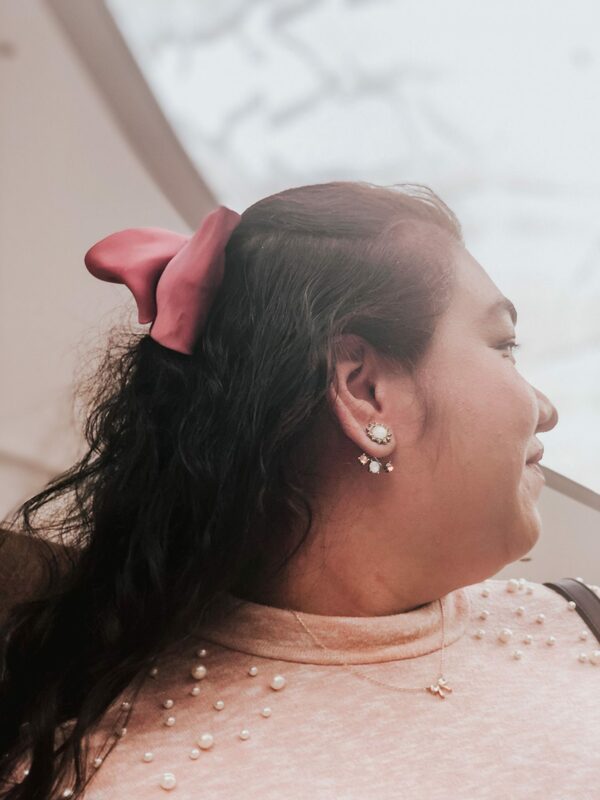 I was always drawn to the Pandora tiara and bow ring so when I was in NYC I bought the tiara ring as a remembrance from the trip and the bow ring was a gift from my parents for Christmas. Now I can’t wait to wear them and whenever I spot them I smile. I have a few on my wish list still so for someone who had no rings to wanting to collect so many that is quite a change. I’m more of a bracelet person and always have been. I’m not into the whole dozen of bracelets look but I do like wearing a few. Over the years, I’ve had so many cheap bracelets but I finally got some good quality ones. I got a Pandora bracelet for my 24th birthday which I share with you here. I still have the same charm and haven’t added it on yet but hopefully I will soon. Next is a Kate Spade bow bangle and this is my first bangle. It has mini bows etched into it and it kind of reminds me of the Cartier bracelet from a far but it isn’t a dupe. I think I like this more as it has bows and you can definitely see a theme of bow jewelry. Last is this rose gold bow bracelet that ties around your wrist from Express. I love how it matches my bow ring and I love wearing them together. I love when my jewelry matches and I have all the bows. 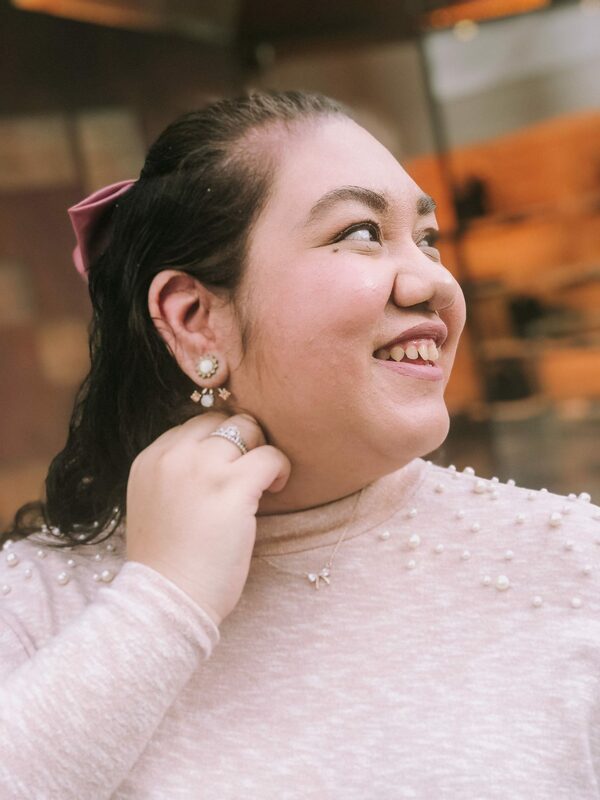 Sometimes I love dainty studs or other times I’ll go for the statement earrings that are larger then life. For everyday I normally just go for some bow studs. I have a few kinds so I just alternate between them. I have a few gold pairs and even red bows for Christmas. Then I have some elegant ones like some pearl drop earrings my mom gave to me last year which I always saw her earring when I was little. Then I recently just bought these rose gold hoops which are actually were apart of a three piece set with yellow gold and white gold hoops. I gave them to my mom as she loves these and I thought we could have matching earrings. She loves the style and I had so many as well growing up but haven’t had a good pair like these since. They are my special occasion earrings and I don’t wear them too often but I adore them. Last are my obnoxiously big statement earrings which I have quite the collection. I have tassel earrings, big chandelier earrings, pom pom earrings and these giant red glitter bow earrings I wear on Christmas. For necklaces, I am the same way with earrings. I have the dainty everyday piece or a statement necklace. I have a few bow pendent necklaces in different shapes and metals which I rotate between. I like wearing them on their own or layering them. I do have a few that aren’t just bows like a heart pendent, a simple diamond pendent and I even have one with my name which I bought in NYC as well. Then I have a few statement necklaces I wear when the outfit needs them. I haven’t reached for one in a while but I have them if I do want to. Those were my go to everyday dainty jewelry pieces! I also have a video on my Youtube channel to see more of my jewelry and how I store them in real time. I also give some more info and the story behind some of the pieces. I was never a proper jewelry wearer until recently but now that I accessorize more I find it so fun collecting and playing with the pieces. 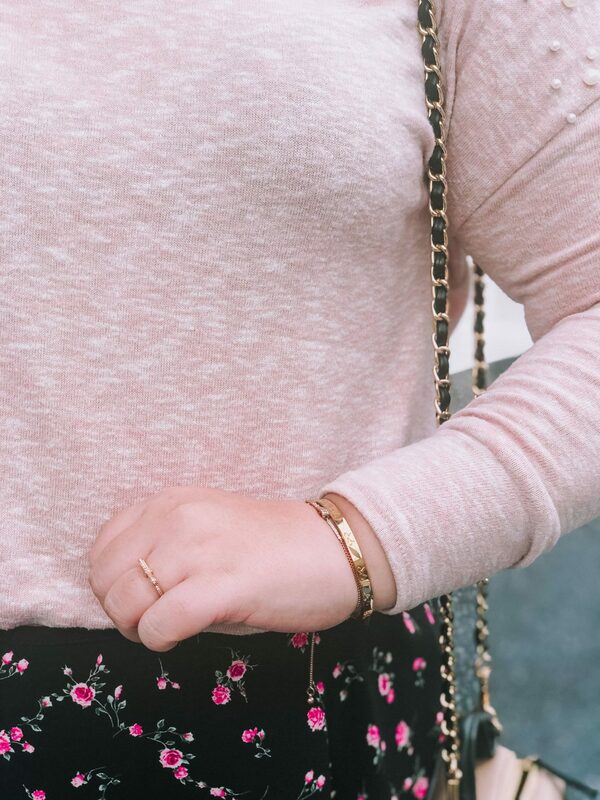 I hope you enjoyed my go to everyday dainty jewelry pieces and let me know your favorite thing to wear! Women who wear pretty jewelry just always seem to have their lives together! Haha. I am sorely lacking in this arena. This has inspired me to invest in some simple, classic peices so I can look put together, too! 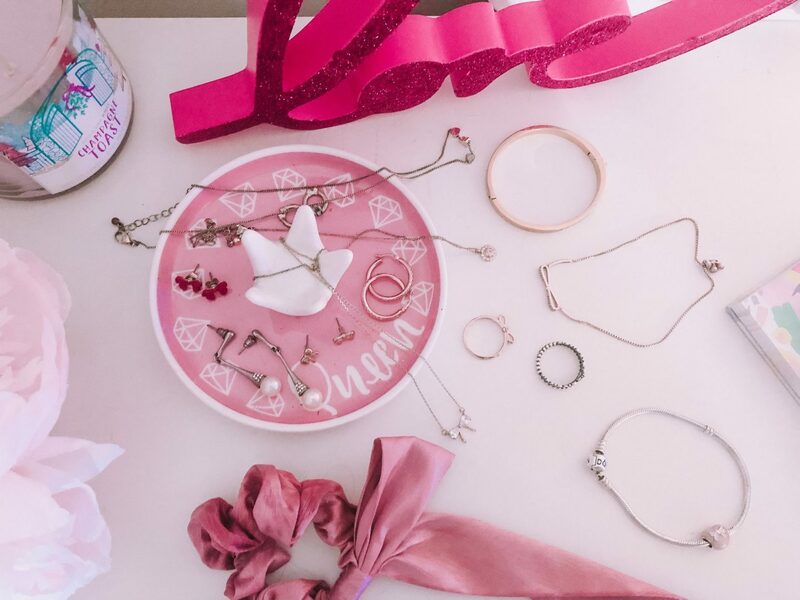 I love that bow ring so much! You have such great style. 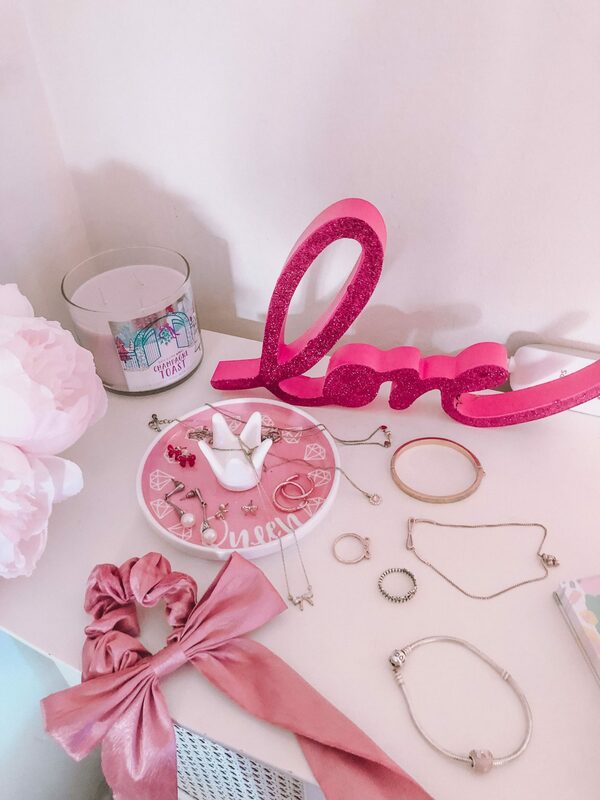 Love all these pieces, especially the ones with bows, and that all your storage pieces match everything! Super cute! Such pretty pictures! And I love the jewelry holder. I always liked jewelry but always forgot to put it on before leaving the house. Now I’m much more into it and my favourite is definitely earrings because I almost forget that I’m wearing them while necklaces and bracelets can sometimes be a bit uncomfortable and get worn out quicker because they’re in direct contact with the skin so I only have a couple of necklaces and bracelets and they’re either in gold, silver or stainless steel. I don’t have any rings but that Pandora tiara ring has been on my wishlist for the longest time, it’s so beautiful. Super cute outfit. 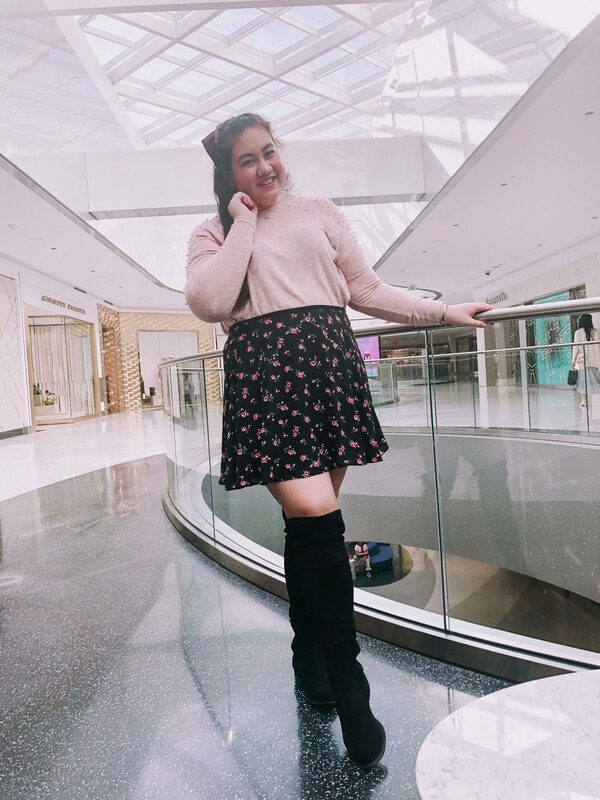 I’m getting a 90’s vibe with the light pink, mini skirt and high boots. I don’t have lots of accessories but I really think I need to invest on them more! These are so pretty! I love simple and understated, feminine jewelry!